Taxonomic characters to identify the Indian plants are very clear with fringed and or non-fringed petals. However, it was mentioned that morphological data of the genus Ruta have not been successful in elucidating the taxonomic boundaries, and one of the reason was the conflicting and overlapping characters. Three species, R. graveolens, R. chalepensis, and R. montana might have been confused in the ancient medical texts. In India two species of Ruta, R. graveolens and R. chalepensis, got confused , with one another. Apart from the confusion between these two species, due to sharing of vernacular name Satab R. graveolens, is misidentified or used as a substitute of Euphorbia dracunculoides. Morphological characters ,,,,,,, and dichotomous key to differentiate both the species, are also provided. It is mentioned that R. graveolens are a hairless herb  or as glabrous herb ,, or there was no mention about the presence of glandular hairs/trichomes on the plant. , Morphologically R. chalepensis flowers can be differentiated by its fringe or ciliate petals, whereas R. graveolens has smooth or undulate but not fringed petals. While describing the anatomical characters of the family, Rutaceae, specific characters pertain to R. graveolens were also described. There is no mention about the presence of hairs in stem or in leaf. The pericycle in stem usually contains small isolated strands or bundles of sclerenchyma, vessels are arranged in less pronounced radial rows, pith cells are homogenous and clustered crystals of calcium are abundant in the cortex and/or pith. Petiole has an arc of separate bundles, a characteristic feature of R. graveolens not observed in any other species of the family. Stomata are present on both surfaces and hypoderm are present. Pharmacognostic characters  along with microscopic descriptions , are described in few publications. In one of the publication,  it is mentioned that stem has dictyostele, with a ring of sclerenchyma and acicular calcium oxalates. In leaf, epidermal cells of the adaxial surface are larger in size and it lacks stomata. Trichomes are absent. Hypodermis is represented as one or few layers of collenchyma in the midrib. Vascular bundle is solitary and arc shaped. No report on the presence of pith in roots. Another publication  reports roots having distinct hypodermis and pith. In stem, hypodermis is made of collenchyma, pericycle represented by non-lignified fibers and calcium oxalates are crystalline. It also has patches of lignified stone cells in cortex. In leaves, glandular trichomes and sunken stomata are present on both surfaces. Upon reviewing the anatomical characters  and pharmacognostic characters , it is highly confused and conflicted. The characters described are opposite of each other. With the published characteristics, it is not possible to conclude the authenticity of the market sample of R. graveolens and to differentiate it from R. chalepensis. Present work is to narrate the pharmacognostic characteristic features of R. graveolens and to differentiate it with R. chalepensis. Samples of R. graveolens were purchased from different suppliers throughout the country. It was also imported from few reliable sources outside India for a comparative study. It was also collected from various gardens and medicinal plant nurseries. Collected plants were identified with morphological descriptions and taxonomic keys provided in various texts. ,,,,, Voucher specimens were stored in in-house raw material archive (Voucher specimen nos: NPD/807/12 to NPD/89/12. Pharmacognostic characteristics including organoleptic, macroscopic, microscopic and powder characters were studied as described in quality control methods ,, of crude herbal drugs. Crude herbs purchased from various suppliers were also subjected to the same testing to for its authenticity. Ruta graveolens L., is a perennial, scented and glabrous herb or a sub-shrub. Stem is slender, smooth, pale glaucous green and reaches up to a meter in height. Leaves are alternate, gland-dotted, glaucous, compound, 2-3 pinnate. Leaf-lets are linear-oval or oblong. Inflorescence is terminal corymbose, irregularly dichotomous cymes. Flowers are regular bisexual, terminal ones are pentamerous and others are tetramerous. Petals are distinct, widely spreading, greenish yellow, wide and hooded at top, abruptly connected to narrow claw below, margin wavy and sometimes toothed [Figure 1]a. Fruits are dry, hard, roundish, 4-5 blunted lobed at top [Figure 1]b. Ruta chalepensis L. is observed more or less similar in its morphological characters. 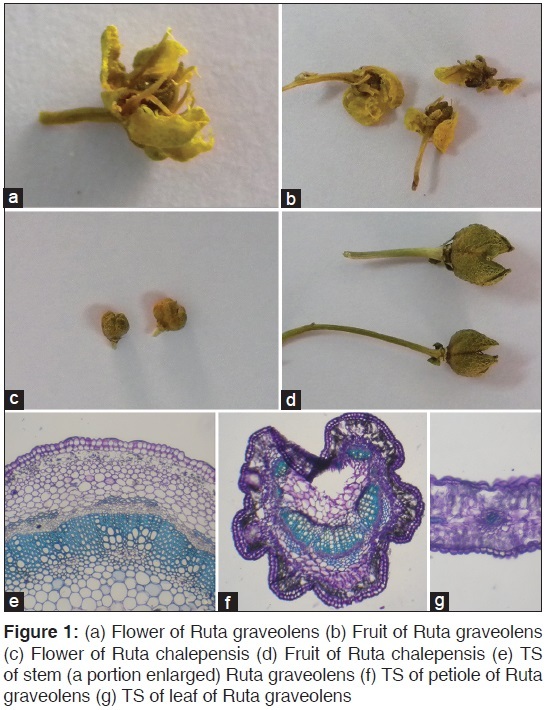 The strong fetid smell, ciliate or fringed petals [Figure 1]c and sharp fruit lobe tops [Figure 1]d differentiate this plant from Ruta Graveolens L.
Market sample consists of chopped pieces or the coarsely powdered aerial parts. They are aromatic and pleasant. The bulk sample is mild to grayish green in color. Usually stem pieces and leaves are the major portion of the bulk sample. It also consists of flowers and fruits in notable quantity but not in all batches. Stem pieces are up to 15 cm long and 5 mm in thickness. They are mild green outer and white inside, longitudinally shrunken or flattened, hollow or with white translucent pith, smooth surface, sharp in cut ends, woody and fracture is fibrous. Leaves are slightly fragile and most of them are nearly powdery in the bulk sample. They are green to mild green to grayish green in color, thin, papery, with minute dots of dark green colored glands everywhere. Leaflets detach or get fragmented while handling. Flowers are dull and dark yellow. Petals are clearly undulate [Figure 1]a. Fruits are 4 or 5 lobed and have blunted tips [Figure 1]b. Market sample consists of chopped pieces or the coarsely powdered aerial parts. They are strongly aromatic and fetid. The bulk sample is green to dark green in color. Along with stem and leaves, inflorescence, flowers and fruits are also present, almost in all the supplies. Stem pieces are up to 1 cm in thickness. Pith is mostly hollow in thicker pieces. Leaves are green to dark green and not highly fragile. Petals are fringed or ciliated [Figure 1]c. Top of the fruits are sharply pointed [Figure 1]d.
[Figure 1]e Following description applies to both the species unless otherwise stated. Stem TS is nearly pentagonal outline with blunted corners. It shows outer epidermis followed by hypodermis, cortex, vascular zone and central pith. Epidermis and hypodermis are single layered. Cortex is differentiated in to outer few layers of chlorenchyma and inner parenchyma. Chlorenchyma is loosely arranged as aerenchyma with lot of air spaces. Parenchyma is normal with intercellular spaces. Pericycle is made of patches of lignified fibers. Lumen of fibers is wide and clearly visible in R. graveolens, whereas in R. chalepensis it is narrow and represented as a dot. Phloem and xylem shows usual elements. Pith is large, parenchymatous and undifferentiated. Minute starch grains are observed in parenchyma cells of cortex, especially more in chlorenchyma region than other cells. Pith cells do not show any starch grains. Calcium oxalates are observed in parenchyma cells of cortex and pith. In R. graveolens, it is scarcely found, whereas in R. chalepensis, it is abundant and observed plenty in each and every field observed. Petiole [Figure 1]f shows 3-5 vascular bundles in an arc. Above the arc numerous smaller sized bundles are present which may be the leaf traces. Midrib and lamina [Figure 1]g showed a typical dicot structure with single layered epidermis, double layered palisade cells and loosely arranged spongy cells. Rosette type of calcium oxalates are abundant, especially located in-between the palisade and spongy layers in R. graveolens whereas it is scare or nil in R. chalepensis. Though the taxonomic key, based on the flower morphology, to identify the species of Ruta, it is reported that they got confused with each other. In few of the herbal gardens, the collected the samples that too were spurious, however, grown as authentic. This may happen due to lack of taxonomists in today's scenario. Upon observing many of the commercial samples from Indian suppliers, it is found that R. chalepensis is very common and they are sold as R. graveolens hence the former is the adulterant. However, few of them supplied the authentic plant. The samples from suppliers abroad were authentic. Hence, it is concluded that the confusion between these two species exists in India and not in international trade. After comparing the macroscopic and microscopic characters with the characters described in the published pharmacognosy reports, it is concluded that the authors  might have wrongly identified R. chalepensis as R. graveolens. Hence the descriptions provided in their article pertain to R. chalepensis and not to R. graveolens. In another pharmacognosy report,  the plant was identified by an eminent taxonomist and mentioned that glandular trichomes are the characteristic features of the authentic plant. We conclude that, while working, the samples may get mixed up with some other sample, which have glandular trichomes and the authors wrongly thought that R. graveolens has glandular trichomes. Glandular trichomes were not observed in our analysis and also it is not reported elsewhere. Instead it is reported as glabrous herbs. Also the authors mentioned that pericyclic fibers are non-lignified and continuous. In our observation, sclerenchymatous pericyclic fibers are arranged in patches as reported earlier. Authors have wrongly identified secondary phloem layers as pericyclic fibers. This confusion may be due to the fact that the authors were pharmacists with limited knowledge on botanical characters. 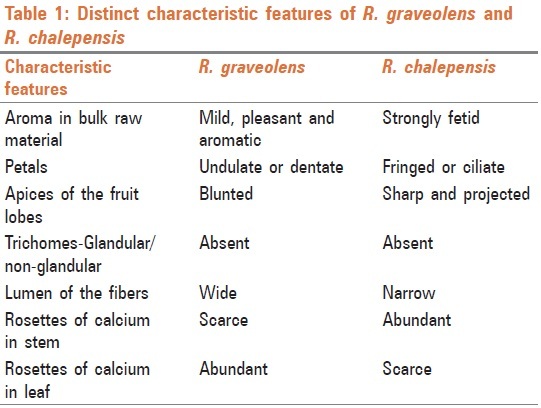 [Table 1], provides the distinct characteristic features to differentiate R. graveolens and R. chalepensis. Also, it is concluded that it is very difficult to identify them, if they got mixed up in bulk sample or in powdered form. Further, DNA fingerprinting is necessary to fulfill the identity of the species in powdered from. 1. Metcalfe CR, Chalk L. Anatomy of Dicotyledons. Vol. 1. Oxford: Oxford University Press; 1967. p. 305-16. 2. Daniel M. Medicinal Plants- chemistry and properties. New Hampshire: Science publishers; 2006. p. 77. 3. Anonymous. The Wealth of India, 5 th ed. New Delhi: CSIR; 2004. p. 94-9. 4. Kiritikar KR, Basu BD. Indian Medicinal Plants with Illustrations, 2 nd ed. Uttrarnchal: Oriental Enterprises; 2003. p. 625-9. 5. Cullen J, Knees SG, Cubey HS. The European garden flora flowering plants. Cambridge: Cambridge University Press; 2011. p. 504. 6. Joshi SG. Medicinal Plants. New Delhi: Oxford and IBH Publishing; 2000. p. 351. 7. Mandal B. Text Book of Homoeopathic Pharmacy. New Delhi: B. Jain Publishers; 2002. p. 327. 8. Vermeulen. F. Prisma-The Arcana of Materia Medica-Illustrated. Vol. 2. Netherlands: Emryss Publishers; 2002. p. 1152. 9. Nadkarni AK. Dr. KM Nadkarni's Indian materia medica. Bombay: Popular Prakashan; 1976. p. 1081-2. 10. Rehman A. Encyclopedia of Remedy Relationships in Homeopathy. Heidelberg: Thieme Medical Publishers; 2005. p. 232-3. 11. Anonymous. Standardization of single drugs of Unani medicine, Part 1. New Delhi: CCRAS; 1987. p. 11 and 134. 12. Kuzovkina I, Al'terman I, Schneider B. Specific accumulation and revised structures of acridone alkaloid glucosides in the tips of transformed roots of Ruta graveolens. Phytochemistry 2004;65:1095-100. 13. Parray SA, Bhut JU, Ahmed G, Jahan N, Sofi G, Iqbal SM. Ruta graveolens from traditional system of medicine to modern pharmacology- an overview. Am J Pharm Tech Res 2012;2:239-52. 14. Munz PA. A California Flora. California: University of California Press; 1959. p. 992. 15. Salvo G, Bacchetta G, Ghahemaninejad F, Conti E. Phylogenetic relationships of Ruteae (Rutaceae)- new evidence from the chloroplast genome and comparisons with non-molecular data. Mol Phylogenet Evol 2008;49:736-48. 16. Pollio A, Natele AD, Appetiti E, Aliotta G, Touwaide A. Continuity and change in the Mediterranean medical tradition: Ruta spp. (Rutaceae) in Hippocratic medicine and present practices. J Ethnopharmacol 2008;116:469-82. 17. Gupta HC. On controversy of the Homoeopathic drug Ruta graveolens Linn, vis-a-vis Ruta chalepensis Linn. CCRH Q Bull 1992;14:26-9. 18. Rao KC. Database of medicinal plants. Geneva: WHO; 1980. Available from: http://www.medicinalplants-kr.org/Ruta_chalepensis.htm [Last accessed on 2013 Jan 01]. 19. Nazish I, Kaskoos RA, Mir SR, Amin S. Ali M. Preliminary pharmacognostical standardization of Ruta graveolens L, Aerial parts. Res J Med Plant 2009;3:41-4. 20. Cullen J, Knees SG. The European garden flora, Resedaceae-Cyrillaceae. Cambridge: Cambridge University Press; 2011. p. 504. 21. Flannery HB. Ornamental characteristics of selected herbs and a key to their identification, New York: Cornell University. 1976. p. 74. 22. Jayaweera DM. Medicinal Plants (Indigenous and Exotic) used in Ceylon. Colombo: The National Science council of Sri Lanka; 1982. p. 35. 23. Available from: http://www.flowersofchania.com/html/ruta_chalepensis_.html [Last accessed on 2013 Jan 01]. 24. Nazish I, Ali M, Mir SR, Parvez N, Yadav S, Hwisa N Application of microscopy in authentication of Unani traditional plant Ruta graveolens. Pharma Sci Monit 2010;1:122-7. 25. Dhale DA, Markandeya SK, Nitrukar YD. Standardization of Homoeopathic drug Ruta graveolens, L. J Phytol 2010;2:1-7. 26. Anonymous. Quality control methods for medicinal plant materials. Geneva: WHO; 1998. p. 10-21. 27. Wallis TC. Textbook of Pharmacognosy. Delhi: CBS Publishers and Distributors; 1985. p. 571-8. 28. Evans WC. Trease and Evans Pharmacognosy, London: Bailliere Tindall; 1989. p. 17-32.